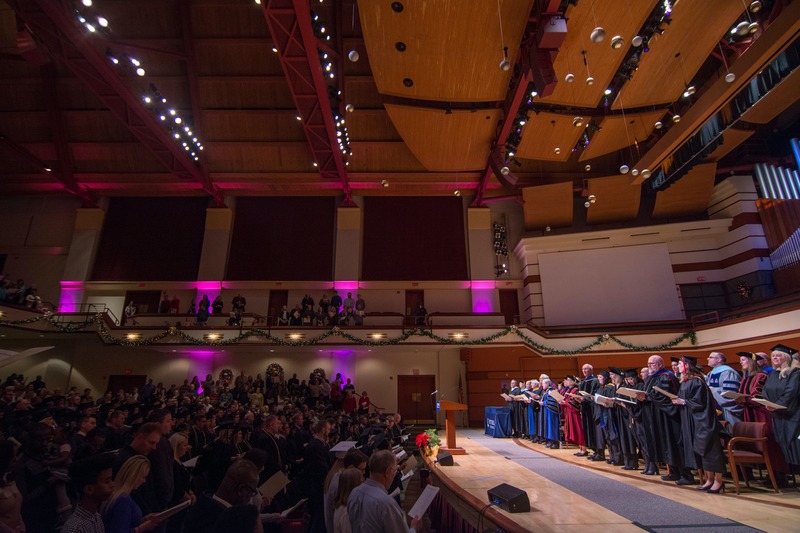 December 19, 2017 | 3:30 p.m.
More than 300 students graduated from Bethel's College of Arts & Sciences, College of Adult & Professional Studies, and Graduate School on December 15. Winter commencement marked an important milestone for more than 300 students, including the College of Adult & Professional Studies’ inaugural class of B.S. in Accounting graduates. In its second year, the newest addition to Bethel’s adult undergraduate business programs has attracted a mix of students from diverse personal and professional backgrounds. Fourteen years and two advanced degrees later, Sanchez Gota works as a data analyst at Wells Fargo. While most of his classmates enrolled in the program to advance careers in finance, Sanchez Gota came to cultivate fluency in business language and better understand the needs of his accounting colleagues. That was especially true for Sanchez Gota, a first-generation immigrant. His entire family is still in Venezuela, which is engulfed in political and economic turmoil. He’s lost several friends to malnutrition, and he hasn’t seen his parents in years. The emotional, spiritual, and even financial support he received from his classmates meant the world to him. Now, Sanchez Gota runs a small technology company that supports Hispanic businesses in the metro area. He plans to return to school to pursue a master’s degree, which he hopes will propel him upward in the information technology field—maybe to places like Google or Microsoft. With the B.S. in Accounting as his third advanced degree, Sanchez Gota believes the sky’s the limit. Learn more about Bethel’s adult undergrad programs.